North Korea’s Nuclear Test: Motivations, Implications, and U.S. Options On October 9, 2006, North Korea announced it conducted a nuclear test. After several days of evaluation, U.S. authorities confirmed that the underground explosion was nuclear, but that the test produced a low yield of less than one kiloton. As the United Nations Security Council met and approved a resolution condemning the tests and calling for punitive sanctions, North Korea remained defiant, insisting that any increased pressure on the regime would be regarded as an act of war. China and South Korea, the top aid providers to and trade partners with the North, supported the resolution itself, but have been unwilling to cut off other economic cooperation and aid considered crucial to the regime. The sanction regime depends heavily on individual states’ compliance with the guidelines. Economists argue that the only definitively effective punishment on North Korea would be the suspension of energy aid from China, which reportedly supplies about 70% of North Korea’s fuel. Determining the motivations of a government as opaque and secretive as North Korea is exceedingly difficult, but analysts have put forth a range of possibilities to explain why the Pyongyang regime decided to test a nuclear weapon. Possible motivations include an attempt to engage the United States in bilateral talks, to ensure the security of the regime, and to satisfy hard-line elements within the Pyongyang government, as well as technical motivations for carrying out a nuclear test. The short-term implications of North Korea’s nuclear test are clear: whether a technical success or failure, North Korea’s willingness to carry out a test in the face of significant opposition indicates that it is willing to endure the potential consequences. Analysts fear that the medium and long-term implications could include a more potent nuclear threat from Pyongyang, a nuclear arms race in Asia, and the transfer of nuclear weapons or material to states or groups hostile to the United States. There are also strong concerns about the impact on the global nonproliferation regime, particularly to other states poised to develop their own nuclear weapon programs. The most fundamental U.S. goals of the confrontation with North Korea are to prevent the proliferation of weapons of mass destruction and to prevent an attack — either nuclear or conventional — on the United States or on its allies in the region. The options available to U.S. policymakers to pursue these goals include the acceptance of North Korea as a nuclear power, bilateral or multilateral negotiations, heightened legal and economic pressure on North Korea, adoption of a regime change policy through non-military means, military action or threats, and withdrawal from the conflict. An anonymous official at the North Korean Embassy in Beijing told a South Korean newspaper that the explosive output was smaller than expected. Due to the secretive nature of North Korea and small yield of the test, there remains some question as to whether it was an unusually small successful test, or a partially failed "fizzle" or dud. It was reported that the government of the People's Republic of China was given a 20-minute advance warning that the test was about to occur. China sent an emergency alert to Washington, D.C. through the United States embassy in Beijing at which time President George W. Bush was told by National Security Advisor Stephen Hadley "shortly after" 10 p.m. (UTC-5) that a test was imminent. North Korea says it set off an underground nuclear explosion Monday, making good on a recent promise to carry out a nuclear test to bolster its defenses. The United States says a North Korean nuclear test would be a provocative act that would aggravate tensions in northeast Asia. President Bush's spokesman, Tony Snow, says American officials are monitoring the situation closely, and he reaffirmed America's commitment to protect and defend its allies in Asia. The U.N. Security Council is expected Monday to begin an urgent examination of Pyongyang's actions. South Korea raised its military alert level after the nuclear-test announcement. The Korean peninsula has been particularly tense since Saturday, when South Korean forces fired at North Korean troops who had crossed the Demilitarized Zone. The North Korean news agency KCNA declared the nuclear test was carried out successfully and safely, with no radiation leakage from the blast site deep underground. Most governments are awaiting confirmation that North Korea did in fact detonate a small nuclear explosion. In Moscow, Russian military experts said to Itar-Tass news agency that they are certain that North Korea's claim was correct. 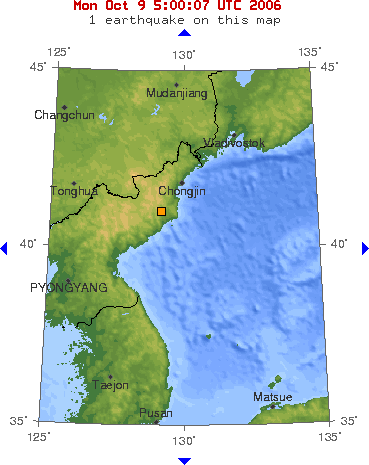 The explosion that rocked northeastern North Korea this morning at 0136 UTC apparently had the effect of a small to moderate earthquake, with a magnitude between 3.5 and 4.2. Japan says the seismic activity that it detected in North Korea was not caused by an earthquake. U.S. and South Korean scientists also detected seismic waves in the same area, at the same time. South Korea says it will respond sternly to North Korea. A spokesman for President Roh Moo-hyun says Seoul will not tolerate a nuclear-armed North. Mr. Roh convened an emergency security meeting in Seoul to discuss the issue. Annotated bibliography on North Korea’s nuclear weapons program from the Alsos Digital Library for Nuclear Issues.